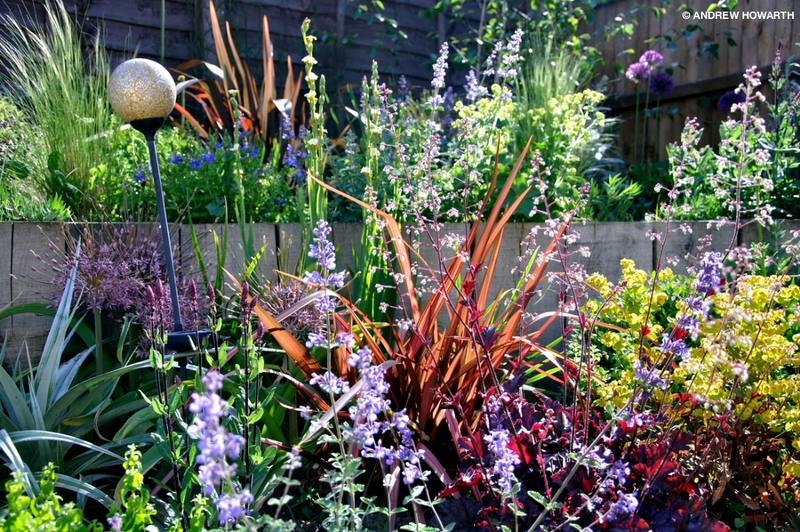 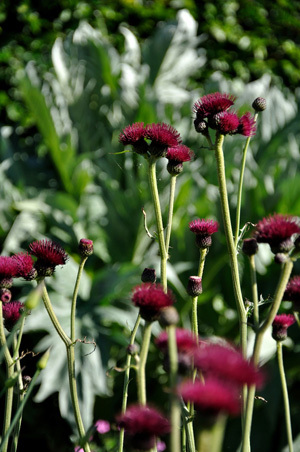 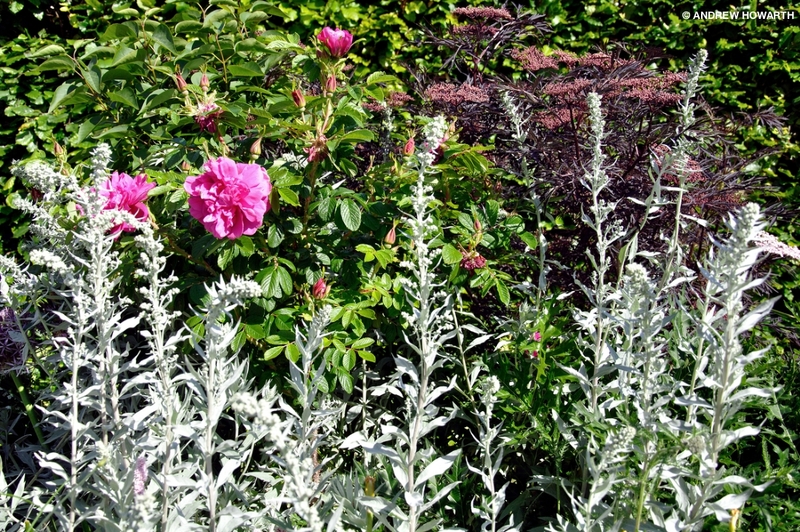 Claire Healey is an independent gardener based in Suffolk. 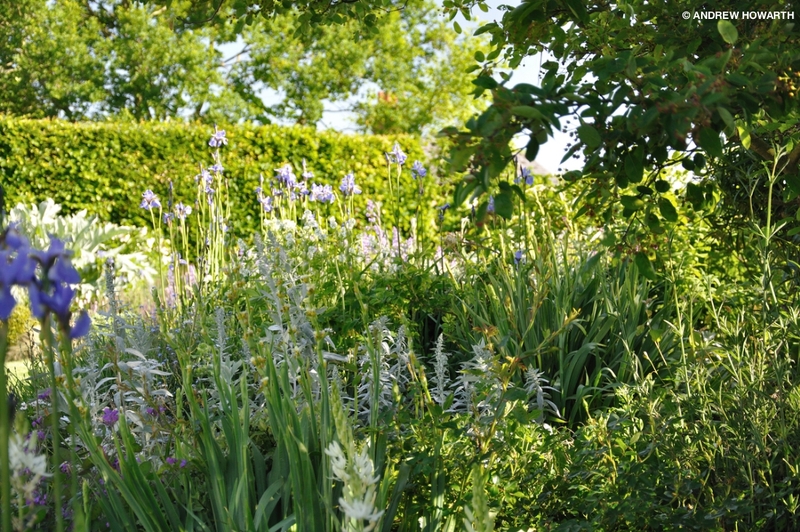 Her gardens reflect not only the properties they form a part of, but also the local environment in which they sit. 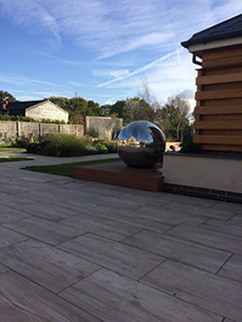 From traditional houses and cottages to designer barn conversions and new builds, Claire’s landscapes feature different combinations of brick, stone, timber and metalwork that are both sympathetic to the properties they belong to and practical to use and maintain. 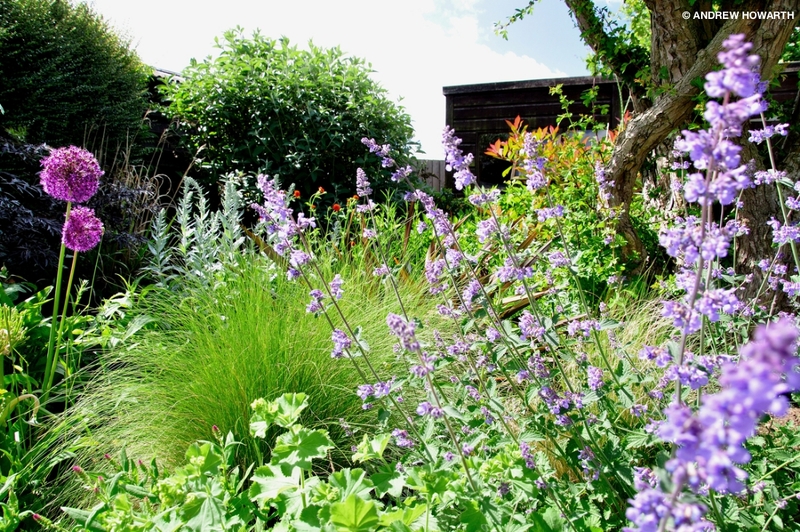 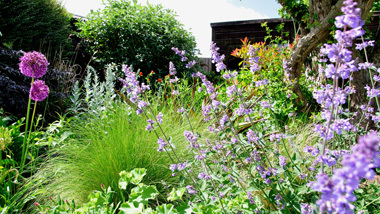 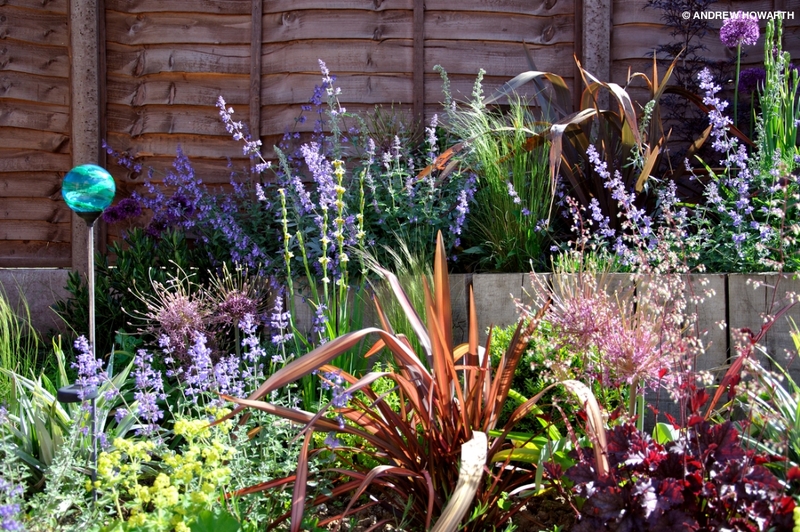 While hard landscaping provides a framework and form, it is Claire’s planting that brings her gardens to life – be it a soft cottage garden or a more dramatic, architectural space. 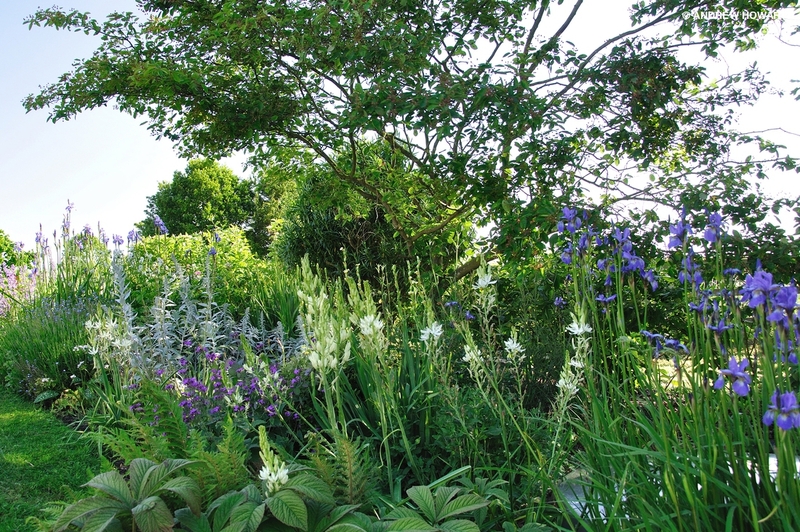 Her intimate knowledge of the soils and climate of the east of England underpins her planting schemes, combining local plants and varieties with non-native species that are proven to thrive in the local conditions. 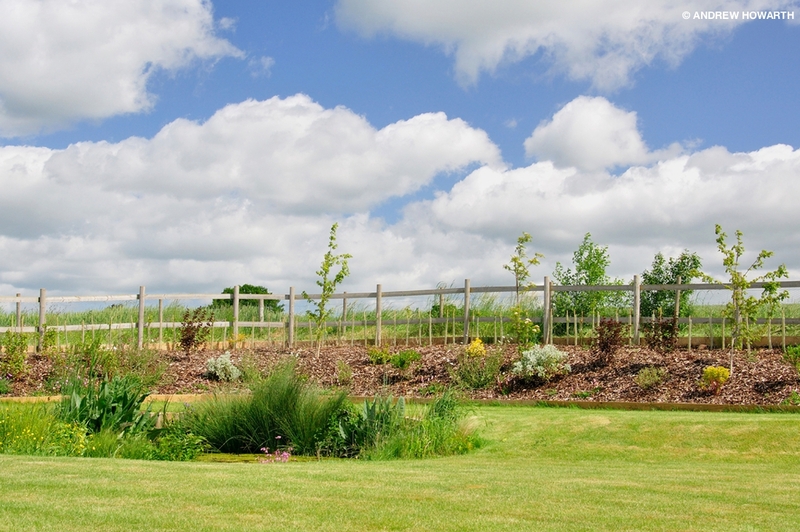 Most important of all, Claire’s gardens are bespoke to their owners. 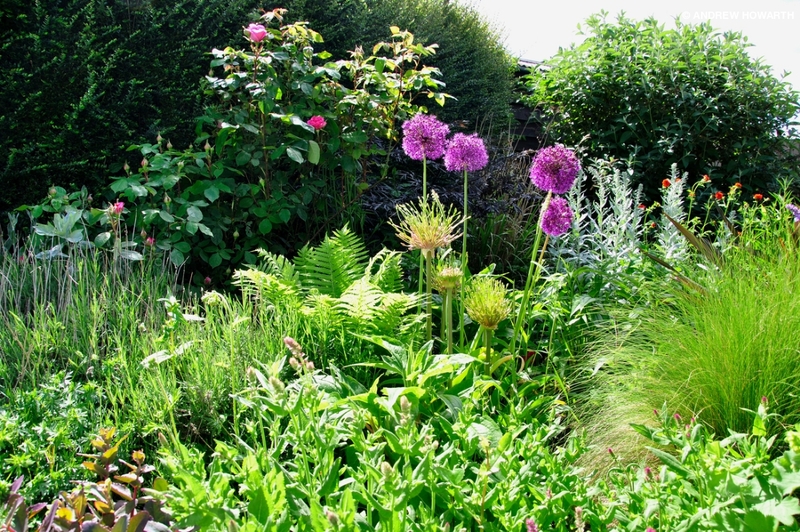 From the formal and geometric to the soft and natural, Claire’s gardens are spaces that people want to spend time in, whether dining and entertaining, propagating flowers, growing vegetables, encouraging wildlife - or simply pottering. 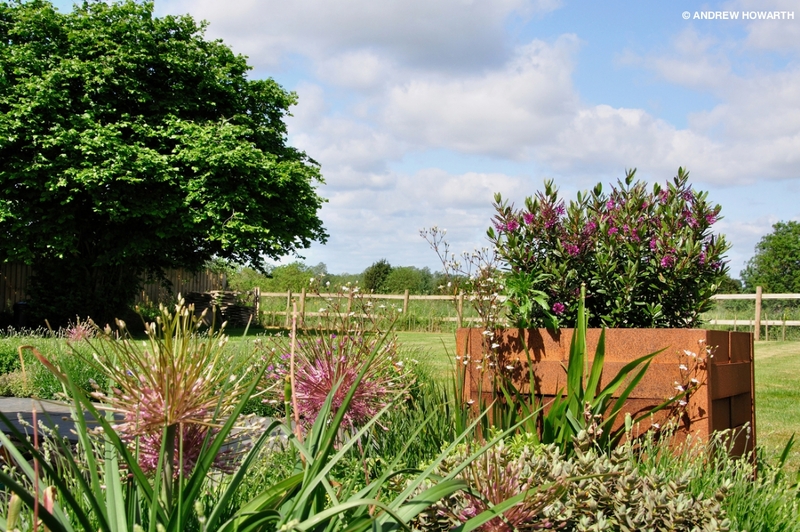 Claire has been creating and caring for gardens of all sizes and styles for 15 years and holds a National Diploma in Garden Design from the internationally renowned Capel Manor College. 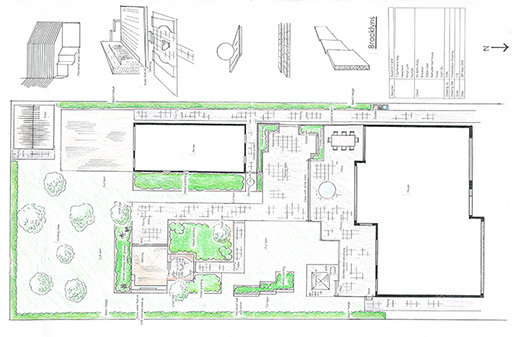 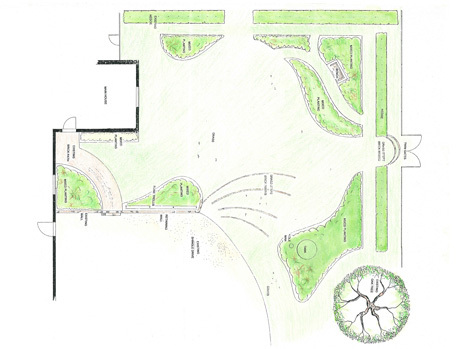 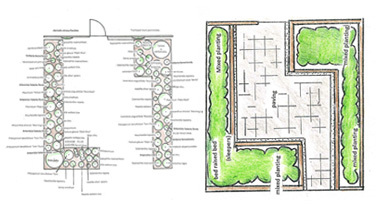 From initial brief, consultation and survey, through design drawings and planting plans to final execution – click here for a project guide. 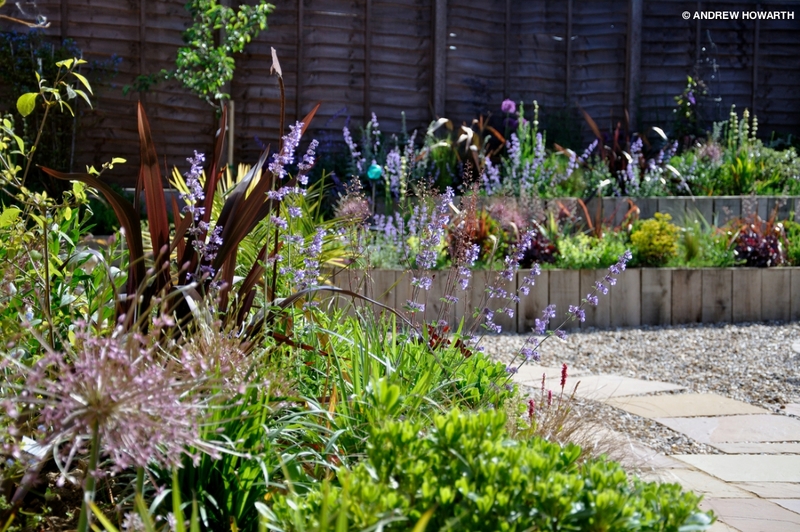 Claire's garden designs are featured in the Spring 2018 edition of the East Anglian Daily Times Your Beautiful Garden Magazine. 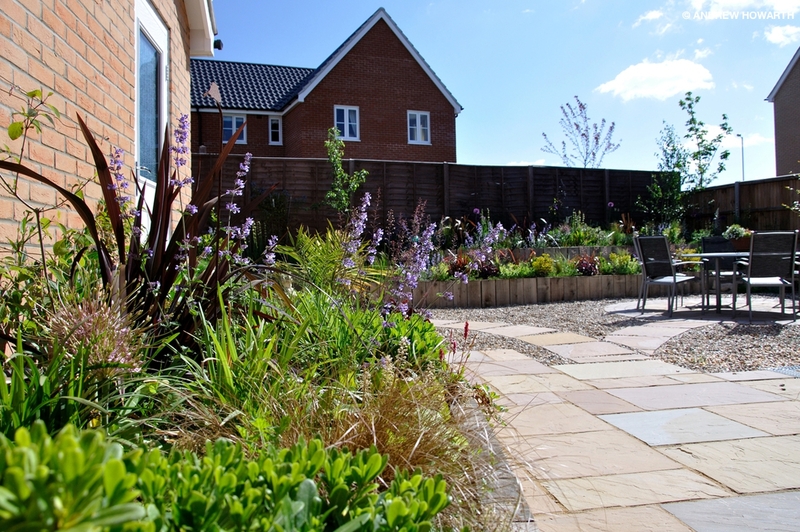 The owners of this striking new build wanted their garden to be a visual extension of the house with bold, structural, colourful landscaping and planting whilst accommodating their various lifestyle needs. 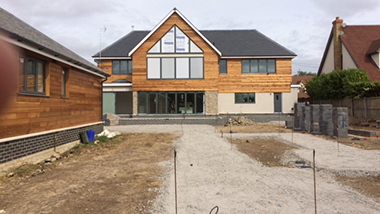 Reflecting the materials used in the construction of the house Claire chose cedar, slate, dry stone and powder coated render creating a large patio for entertaining with a stainless steel balustrade and a deck for sunbathing next to a wall water feature. 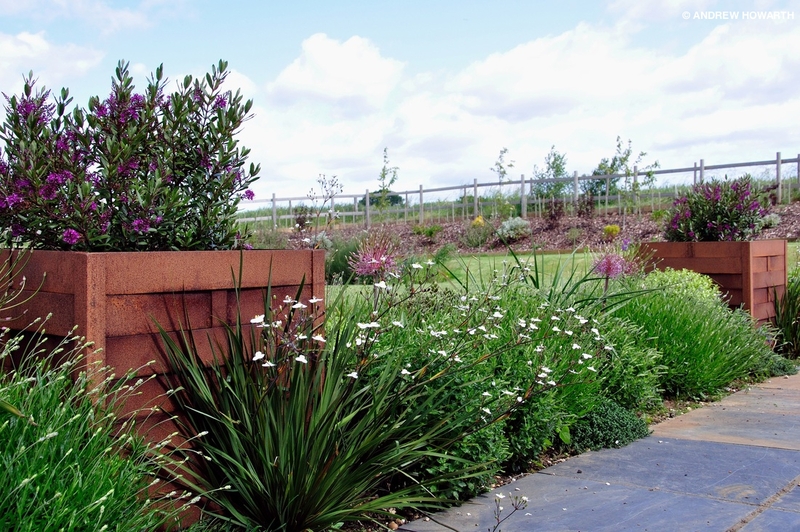 Raised beds showcase herbacious perennials in a purple and white colour palette framed by evergreen shrubs and ornamental grasses whilst a lawn provides a play area for the owners' dogs. 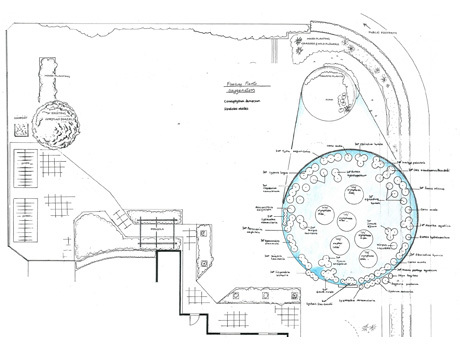 The design also incorporates a free-standing feature wall and a large refective metal ball sculpture. 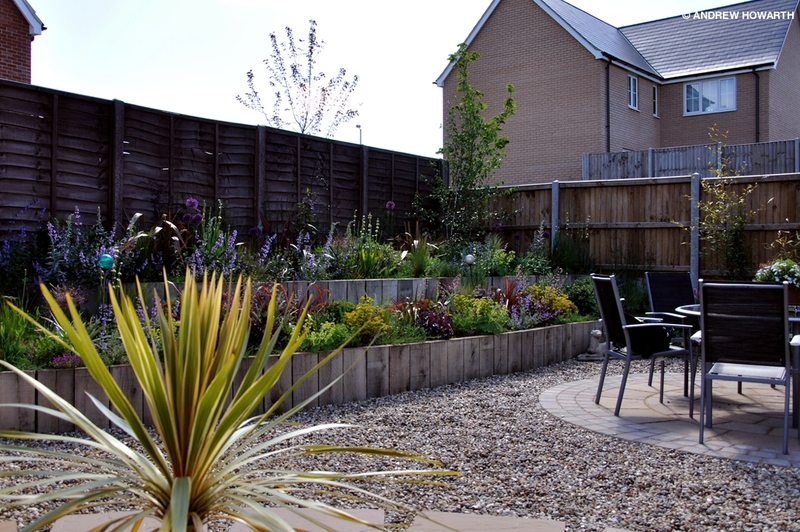 At this new build property in Hadleigh, Claire was commissioned to create a garden from scratch in an empty plot enclosed by standard post and panel fencing. 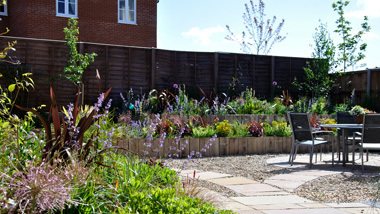 The owners wanted a colourful, elegant, low maintenance space for relaxing and entertaining. 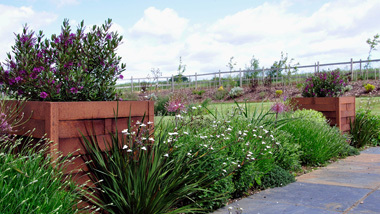 A rotunda patio dining area and sandstone paths are framed by simple pea gravel. 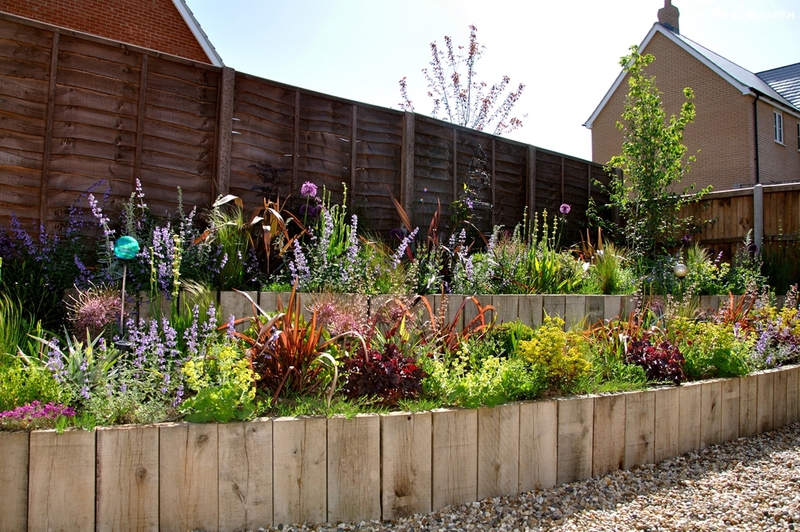 Vertical oak sleepers define a series of raised beds, the main border rising to a second terraced level to add height and create a sense of space. 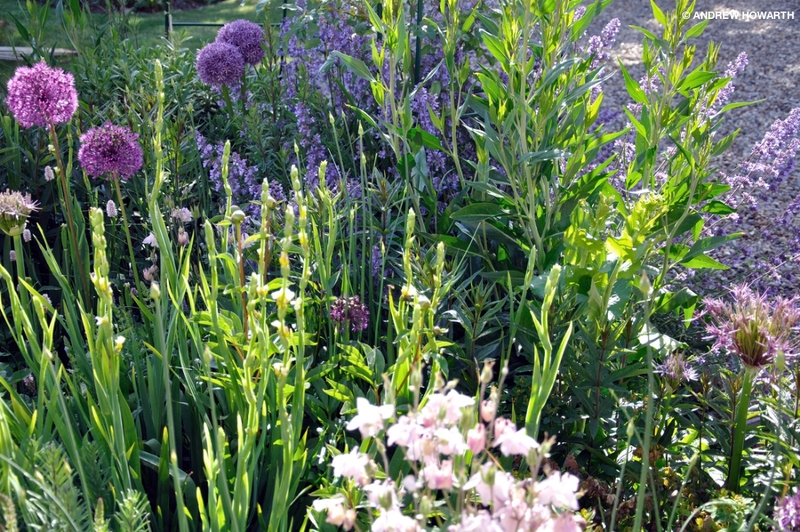 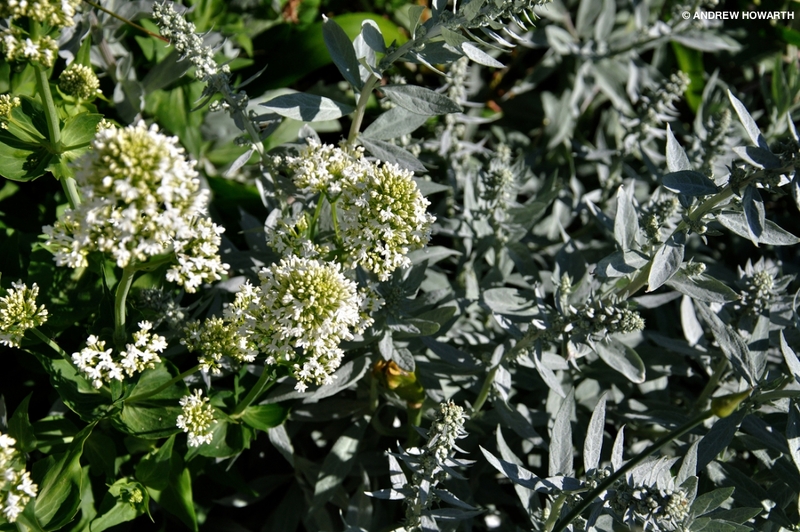 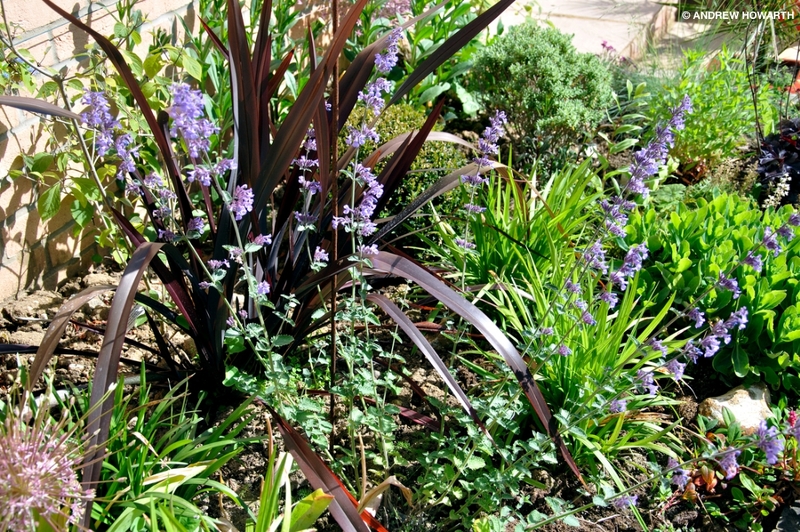 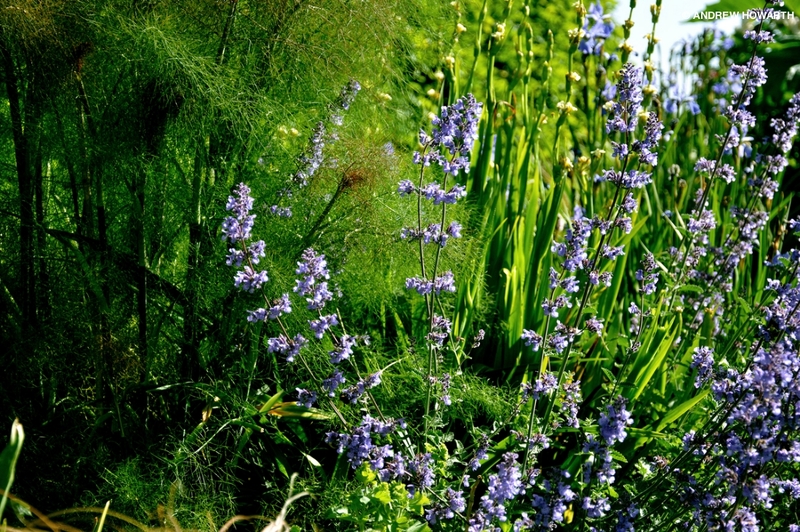 The planting is mostly evergreen shrubs, together with herbaceous perennials, a few ornamental trees and a profusion of spring and summer flowering bulbs. 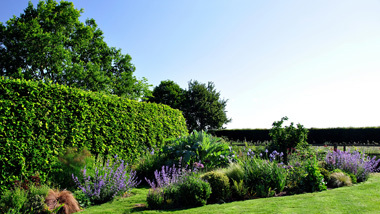 At The Old Rectory in Chattisham, Claire was asked to transform a tired and neglected space into a pretty but functional vegetable garden. 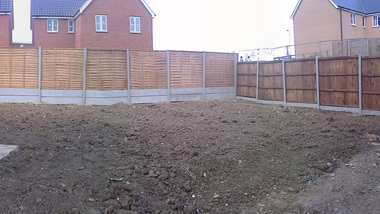 Bounded by brick walls, this part of the garden had been used as a dumping ground for the soil excavated when a swimming pool had been built. 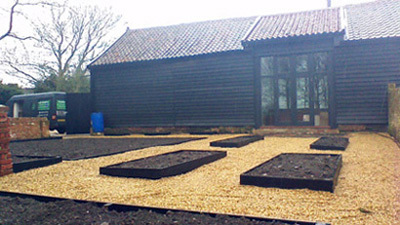 Simple, low level geometric beds constructed from pressure treated timber sit within a carefully proportioned space laid to shingle. 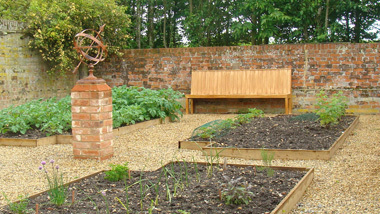 In the centre a rusted, cast iron armillary sundial sits on a brick plinth while a modern wooden bench creates a focal point and somewhere to enjoy a cuppa. 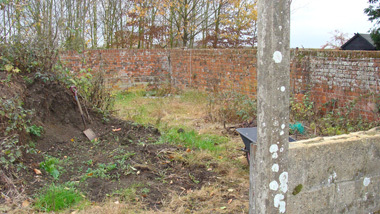 Beyond the Rectory’s new vegetable garden, another run down walled space also provided a blank canvas. 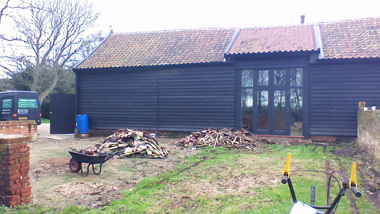 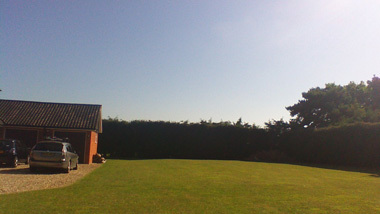 Having recently converted their old black weatherboard Suffolk barn, incorporating imposing full height windows and patio doors, the owners wanted a striking but easy to maintain garden to look out on. 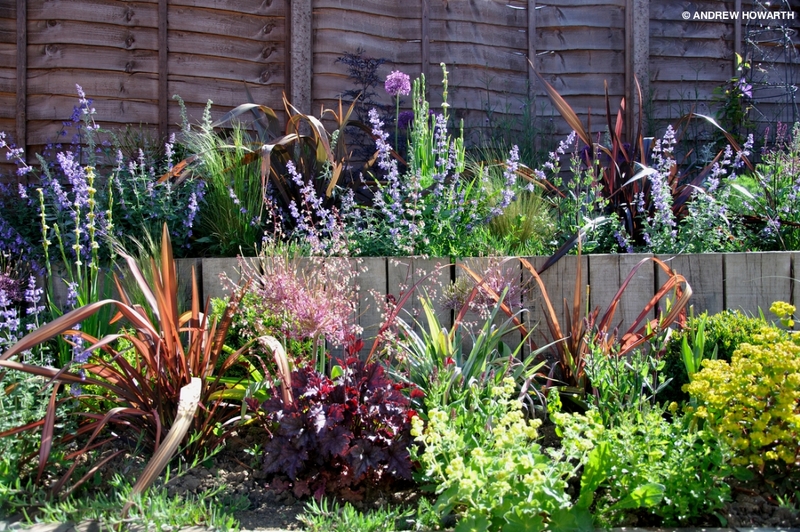 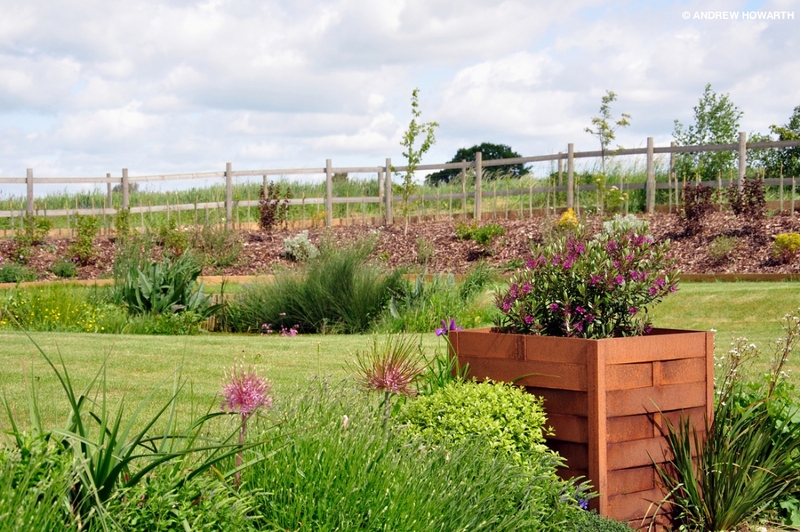 Claire continued the simple, unfussy styling of shingle and low raised beds, combined with a timber edged lawn. 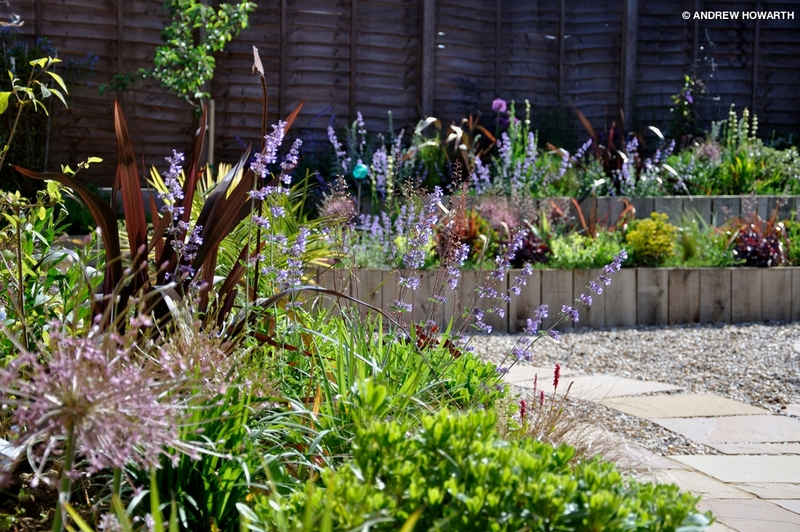 The five raised beds and lawn border have been planted with a selection of small trees, architectural plants, an abundance of grasses for texture and flowers to soften. 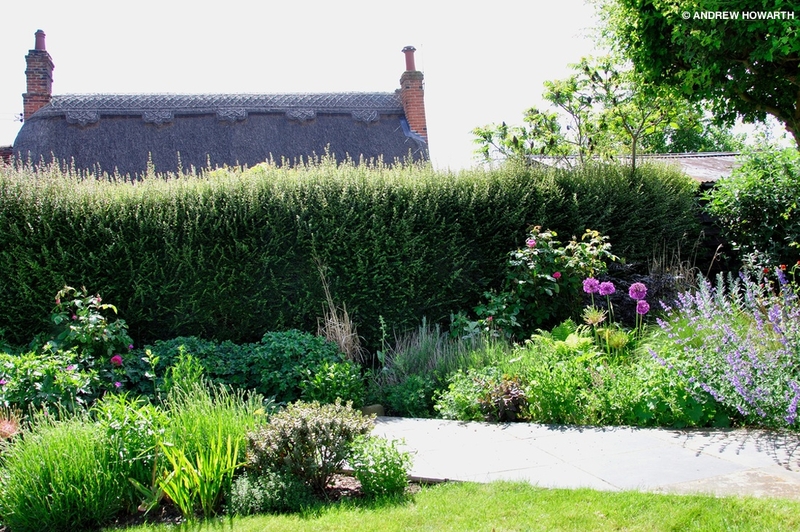 The large garden surrounding this modern but traditionally styled house in Newmans Green was originally all laid to lawn, enclosed by a conifer hedge. 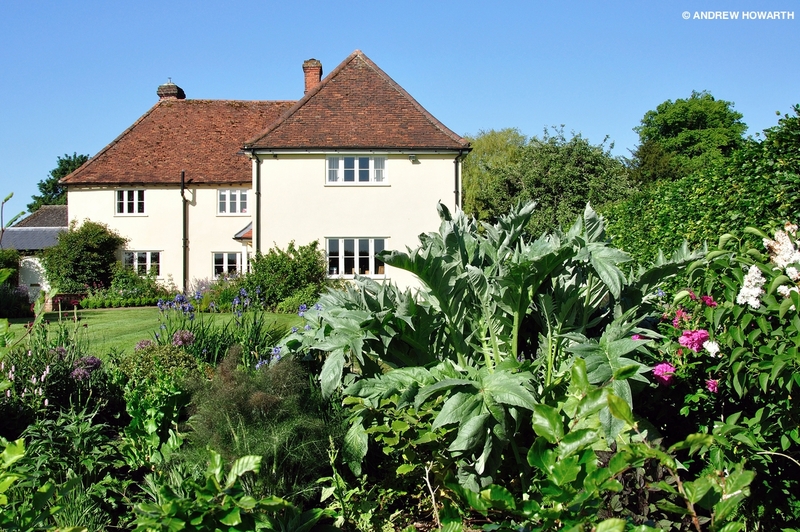 The brief from the owners included a summerhouse with flagstone patio, vegetable and herb beds and a garden shed, which has had planting wrapped around it to soften and disguise. 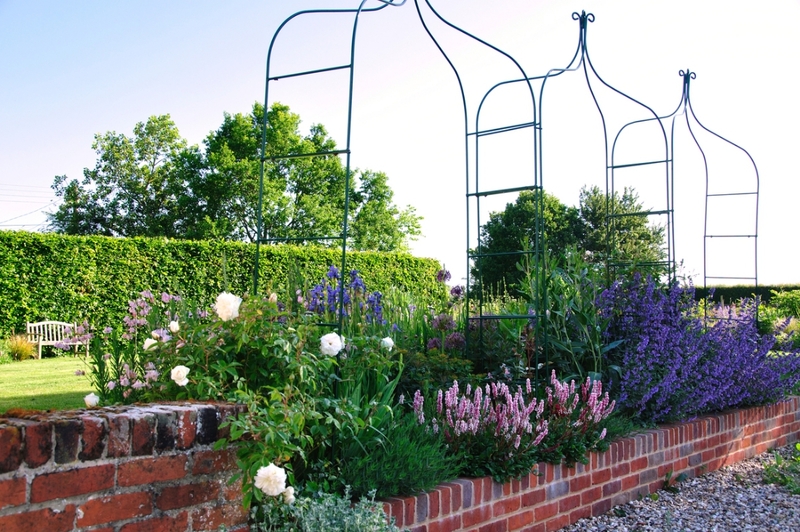 In addition to these structures, Claire has included a bespoke pergola supporting a wisteria and cut curved beds into the lawn to create a series of flowing, interconnected spaces joined by arches planted with clematis. 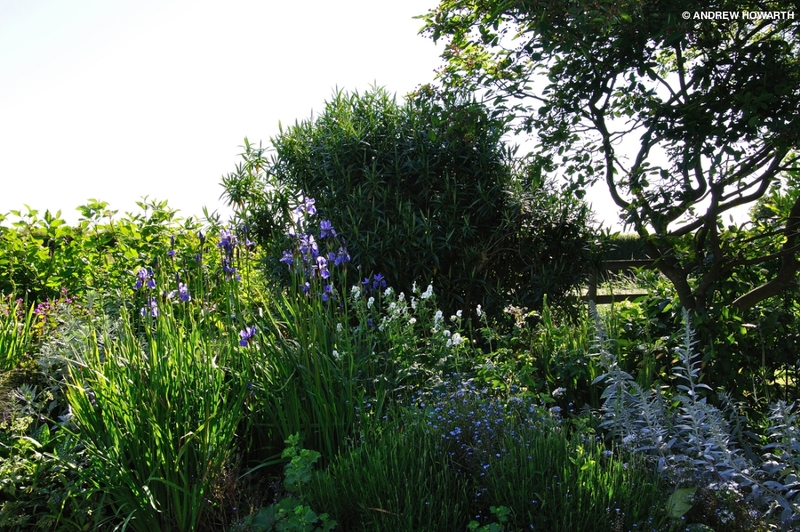 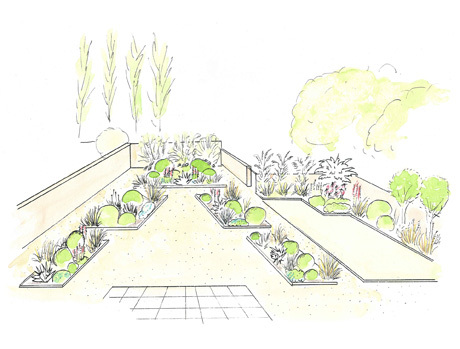 Further height is created by the border planting - dividing and separating the garden to lead the eye and create a sense of journey and exploration. 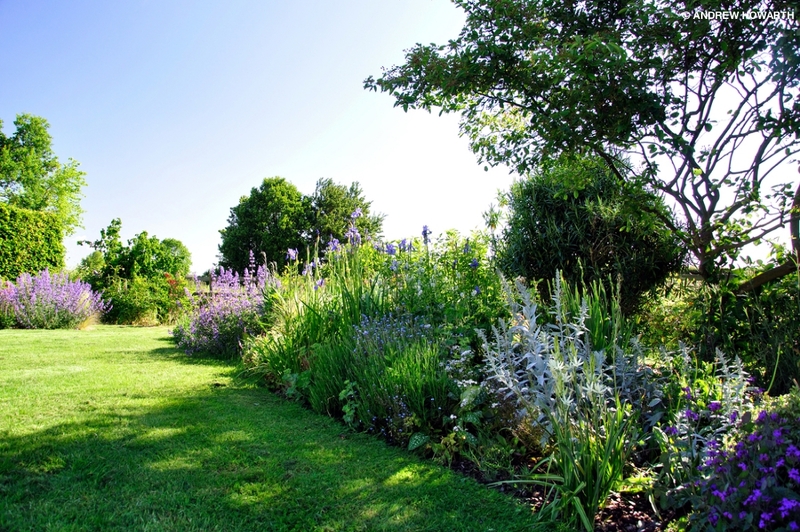 This small garden in Boxford more than tripled in size when the owner was able to acquire some adjacent farmland. 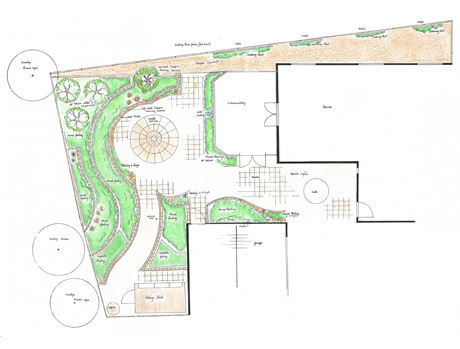 With a patio and pathways already constructed, Claire was asked to develop and plant the space, incorporating a fire pit and a wildlife-friendly, clay-lined pond fed by a natural spring and planted exclusively with native species. 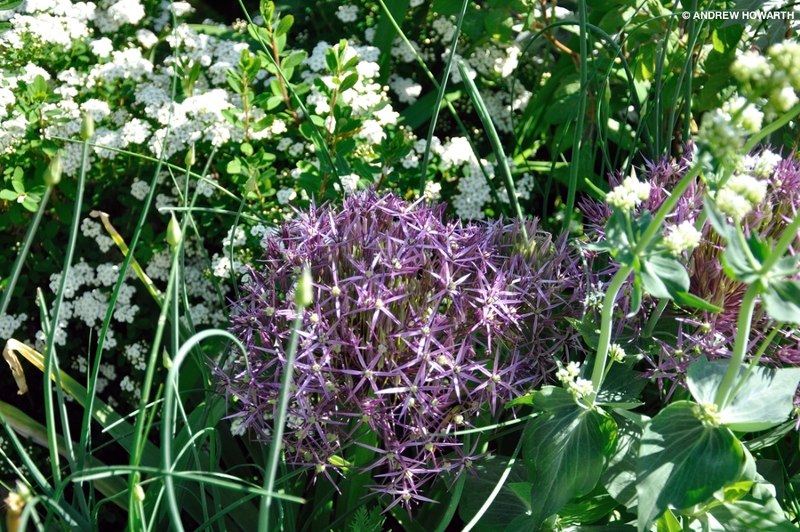 The patio area by the house features giant alliums, soft grasses and a mix of easy to maintain evergreens and perennials. 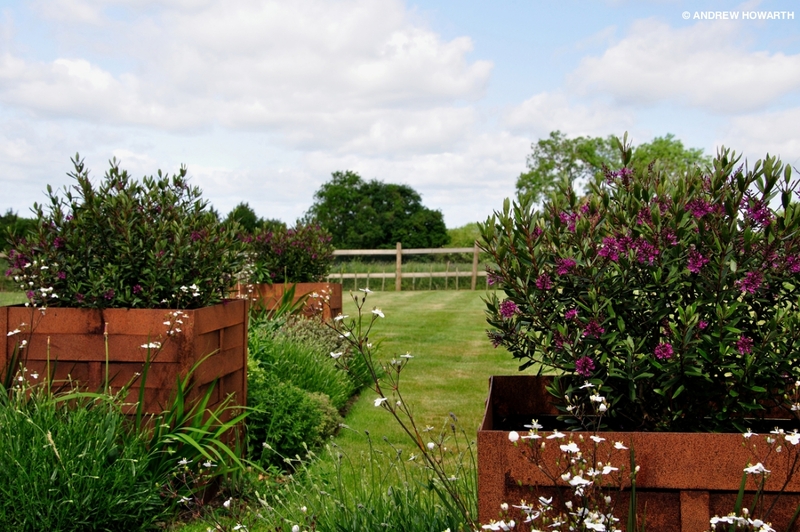 Claire also commissioned a number of square CorTen steel planters which have been planted with evergreen flowering shrubs. 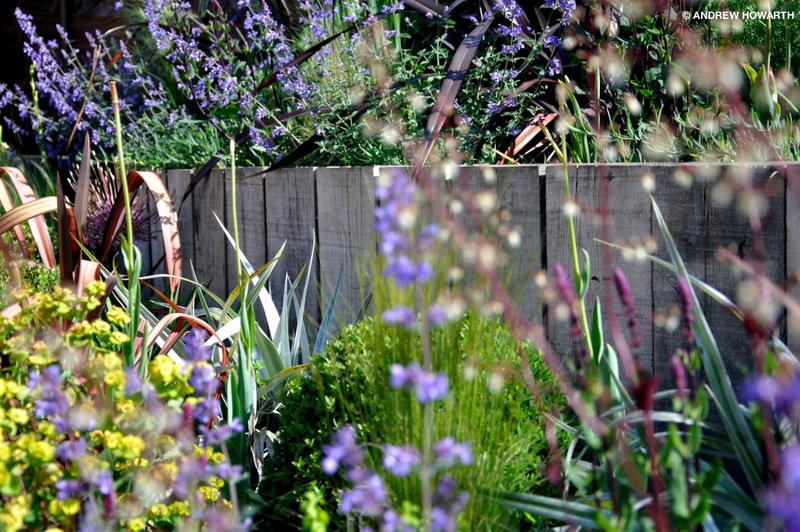 CorTen, the material used to build the Angel of the North, weathers to a striking rusty brown, complementing the property’s roof tiles and the rust-coloured veins of the grey slate patio. 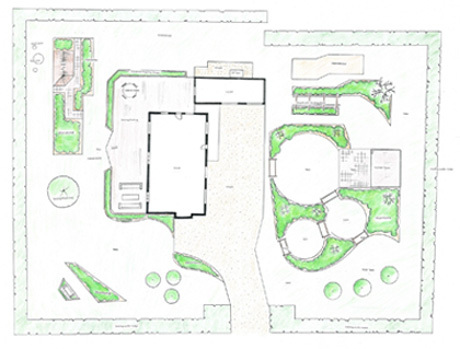 Part of extensive grounds, Claire was asked to redesign the space at the imposing entrance to this large country house. 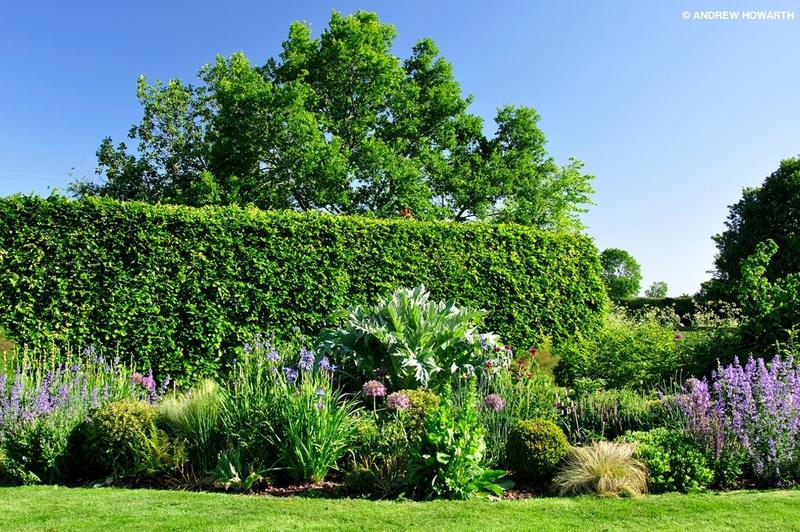 Working around established small trees and shrubs, she created a rise of curved, brick-edged grass steps up from the shingle driveway and cut a series of sweeping island beds into the existing lawn. 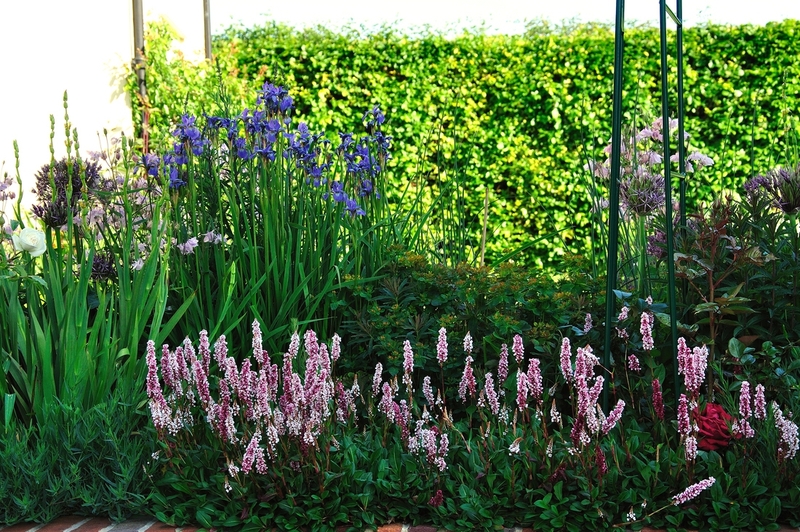 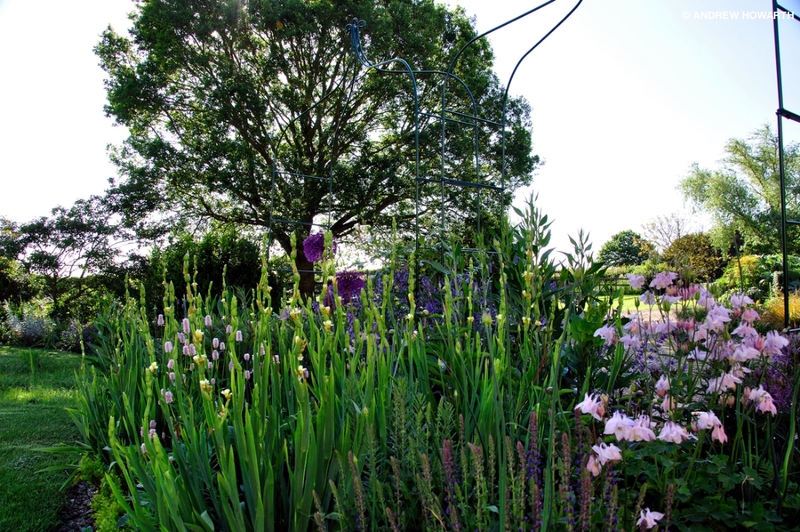 The planting followed a colour palette of purples, pinks, white and silver and included a number of large architectural plants to provide focal points. 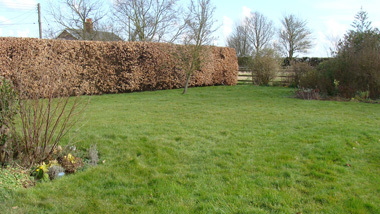 There is also a new beech hedge with a central gap that leads down curving steps to the field beyond. 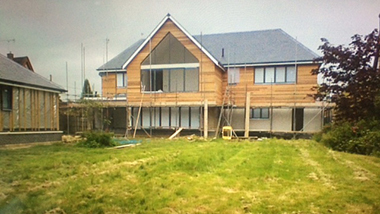 The garden of this new build in Sudbury was entirely undeveloped apart from a decking area immediately behind the house. 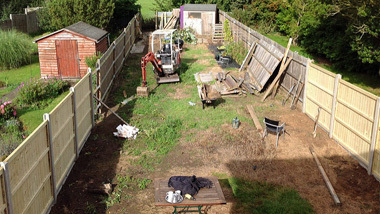 The owners asked Claire to level, build and plant the first third of the space, creating an easy to maintain urban courtyard enclosed by new fencing and trellis. 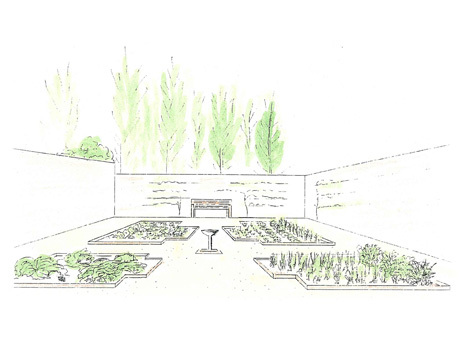 A central patio in grey sandstone sits between two large L-shaped raised beds built from oak sleepers. 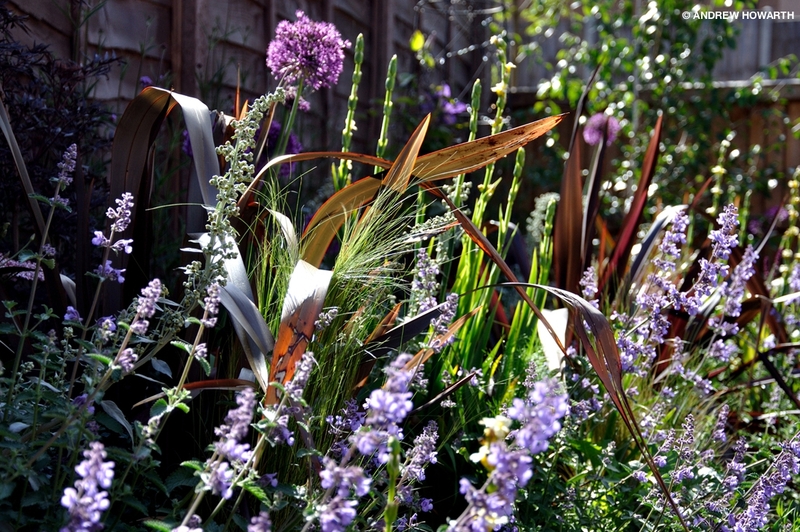 The planting brief was for a slightly tropical, exotic style and features several different spiky phormiums, a thistly cardoon, a hardy date palm, bamboo and grasses. 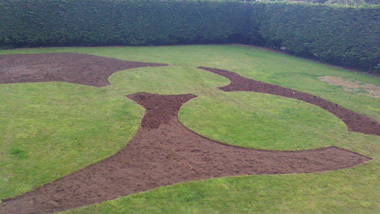 Watch the video for a timelapse of the beds being planted over the course of a day.